There are two main considerations: costs and safety. If you want a pool, it is a much more economical to buy a home with an existing pool rather than to install one. If you buy a home with a pool it may add $10,000 to the price whereas installing the same pool in the same house may cost $40,000 in today’s dollars. A medium size swimming pool cost about $150 a month ($1800 a year) in 2009, if you did the weekly/biweekly work yourself. This counts electricity for running the pump and filter the required number of hours a day, chemicals to keep the pool balanced, and supplies like filters (but excludes capital expenses like resurfacing or installing a salt-to-chlorine converter). Additionally, the water pump(s) usually last about 3 years, and cost $300-$500 to replace (the higher number for a 2 phase pump that conserves electricity). The pool must be isolated from access by an enclosure with specific barrier requirements. The pool must have an approved safety cover. Access from the home must have a hardwired exit alarm with a minimum sound rating. Door providing access from the home must have a self-closing, self latching device with a release no lower than 54 inches above the floor. 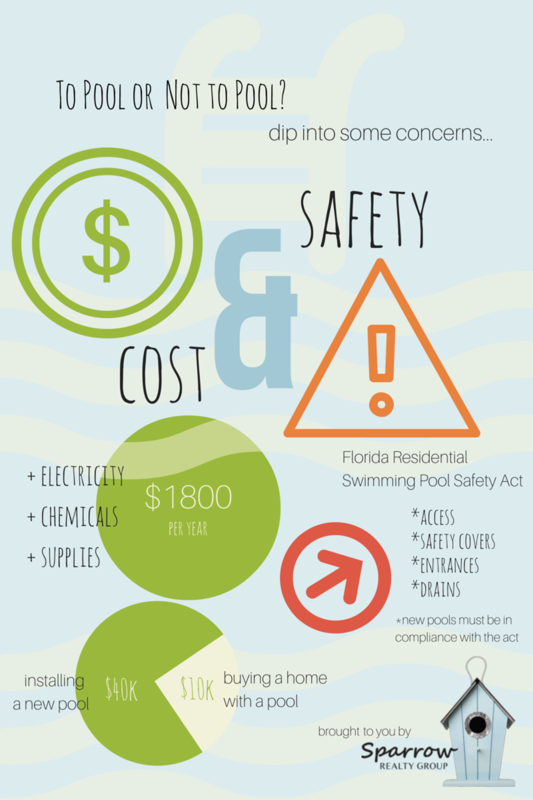 Other requirements apply to residential swimming pools. Now, new pool drain requirements exist. Pool drains must have two main drains with anti-vortex covers. Older drains can be retrofitted with devices that change suction if pressure is detected. This entry was posted in Buyers, Home Improvement, invest, investments, Investors, Pool, properties, real estate, Sell Home Quickly, Sell My Home, Sell My House, Sellers, Uncategorized and tagged Buy a home, investment property, investments, pool, Sell my home. Bookmark the permalink.